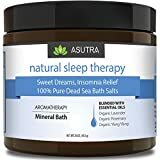 NATURAL SLEEP THERAPY Twenty minutes soaking with Natural Sleep Therapy will prepare your mind and body for sweet dreams. Don't be surprised if you fall asleep faster than you think! A unique blend of Dead Sea Salts with organic essential oils of Lavender, Rosemary and Ylang Ylang which together creates a hypnotic and soothing aroma that sticks with you well after leaving the tub. 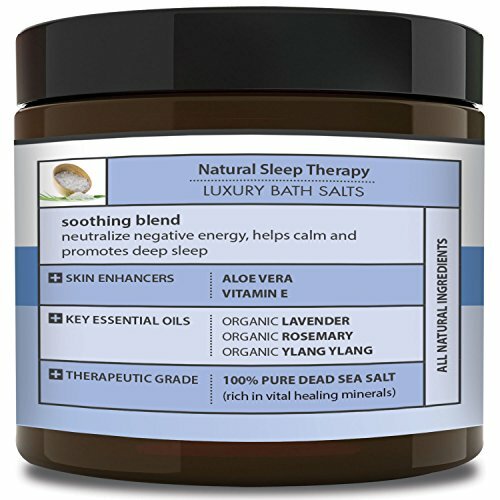 INFUSED WITH ORGANIC ESSENTIAL OILS: As you relax in the tub, breathe in the soothing, therapeutic vapors generated from our unique blend of Organic Lavender, Organic Rosemary and Organic Ylang Ylang essential oils which helps promote a calm, serene state of mind prior to bedtime. This is not your ordinary bath soak! 100% SATISFACTION GUARANTEE We are so confident you will love Natural Sleep Therapy that if it doesn't help you sleep like baby, then just let us know and we will provide you a FULL REFUND - NO QUESTIONS ASKED. 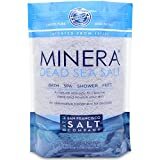 So give it a try - our uniquely formulated dead sea bath soaks are therapeutic grade, truly healing and highly effective - guaranteed. Tired of tossing and turning in bed? Waking up still feeling as if you didn't get any sleep? Are the un-natural sleeping pills taking their toll on your health? This all natural sleep-booster will help you fall asleep faster providing a more restful night's sleep - GUARANTEED! The Original GORILLA GRIP (TM) Non-Slip Spa Bath Pillow Featuring Powerful Gripping Technology. Extra Soft & Large, 14.5 x 11, Luxury 2-Panel Design for Shoulder & Neck Support. Fits Any Size Tub.